Apparently one crafty franchise owner can't just settle for bringing Happy Meals and Big Macs to the masses in Hampton Roads, Virginia. 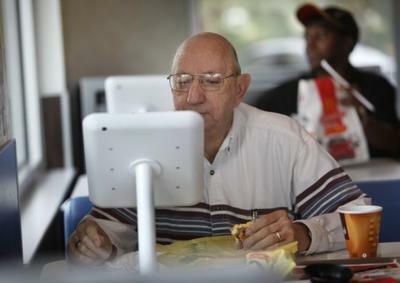 His McDonald's is going the mobile tech route by giving patrons free use of iPads in the dining room. The locked-in stand has another benefit besides security: Since customers are presumably eating when they're using it, it's actually quite convenient, as they can hold a burger in one hand while navigating the tablet with the other. Of course, as the tablets are touchscreen devices, they're still certain to get lubed up with grease and sauce. But should any food matter makes its way into the ports, that may not be a big deal for Fard; he leases the tablets from the French company, which is responsible for replacing them if they get damaged or stolen. The owner also blocked certain websites, like YouTube, to discourage viewing of lewd content on the premises. This isn't a mandate from corporate, but the act of one lone franchise owner. Still, HQ is keeping an eye on how things go at Hampton Roads. HQ will monitor this store for eight months, and if the iPads become a big hit, who knows? We could see them in every location someday.